This is our most economical cushion insert. The outer cover is made of 100% polypropylene fabric and it is filled with 100% siliconized polyester fiber. 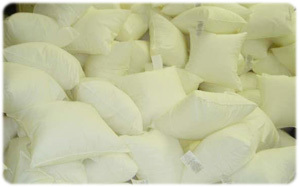 Standard sizes usually kept in stock are: 14”x14”, 16”x16”, 18”x18”, 20”x20”, 25”x25” and 7”x14” neckrolls. We also make round forms, bolsters and custom sizes according to our clients’ requirements. Our unbeatable price makes this item our bestseller. This cotton cushion form is perfect for customers who enjoy the higher end look, but still want good value for their money. 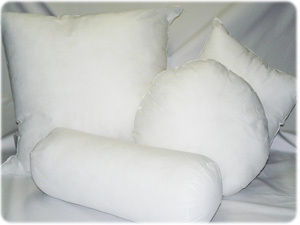 Our cotton cushion insert features a 100% cotton 233TC cover filled with 100% siliconized polyester fiber. This item may also be prepared according to our customers’ specifications and can be square, round, neck roll, bolster or any other shape. For customers who prefer feather filled inserts for their higher end products, we manufacture a plump feather form crafted in 100% cotton 250 TC feather proof twill and filled with a lofty 95% feather 5% down combination. 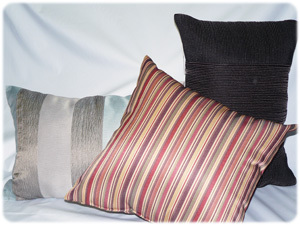 This soft and fluffy insert instantly gives cushions a luxurious, designer feel. This feather form may be custom made in any shape or size. We custom fill patio furniture cushions according to our customers’ specifications. We use premium first grade fiber and our products meet the most stringent quality control requirements. Our satisfied clients sell to major retailers across Canada and the United States.